The Coventry Blitz of 14 November 1940 was a key event of the Second World War and in the growth of public consciousness of the destructive power of warfare. The medieval city, already undergoing rapid change, was largely destroyed on that night. The destruction was seen as an opportunity by some including the then City Architect, Donald Gibson. The result was the first of the master plans for post-war redevelopment of Britain’s bombed city centres. The redevelopment of Coventry city centre to plans by Gibson and his successors provided an intensely urban and civilised centre, embodying new planning principles. Post-war Coventry was hugely influential and Gibson’s ideas helped to shape the rebuilding of other city centres, the post-war new towns and developments in Europe. Despite incremental change in the subsequent decades the planning and architecture of Gibson’s city centre are still clearly legible. Jeremy Gould is an architect and Emeritus Professor of Architecture at Plymouth University. Caroline Gould is an architect. 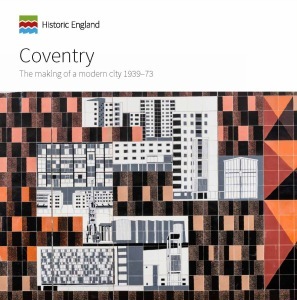 The Goulds' sensitive analysis of the city within this exemplary book aims to inform the public and decision makers of Coventry's significance, so that the best of its remarkable post-war heritage can survive. ... accessible and beautifully presented ... This book will be a rewarding read for those interested in landscape history. ... They have produced an elegant and well-balanced account of the revival of Coventry following war-time devastation. While praising the city's very real achievements, they have not shirked from outlining its recent problems and challenges.